A while back, I became super sensitive to so many skin care items. I went from someone who could use any one dollar eye shadow without a problem to having reactions to some of the most prestigious brands of makeup and skin care on the market. For a long time, the only thing I could do was to make my own skin care with natural ingredients and use very little makeup, mostly mineral kinds. Eventually my skin balanced out and calmed down, but I was so happy with the items and recipes I had found and created that I continued to use many even afterwards. One of my favorite discoveries was coconut oil. What a fabulous item from Mother Nature! 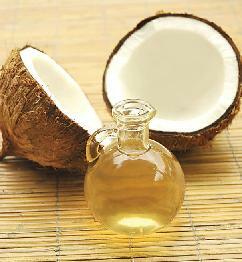 Originally used just in the kitchen, coconut oil has now become one of most used natural oils in the beauty industry. Because it has become so popular, it is now easy to obtain. Before you would have to go through a health food store or an online organic supplier to get a jar of this miracle oil. Now, you can even get a good brand of organic virgin coconut oil in the baking section of Walmart for a more than reasonable price. How awesome is that? Lots of people are talking about the uses and benefits of organic virgin coconut oil. When I wrote for MakeupTalk.com‘s beauty blog, I wrote an article about how coconut oil helps with various skin irritations entitled “Time for the Itchies“. I also wrote an article about how to give yourself an at-home hand spa treatment with coconut oil called “Easy Peasy Hand Pampering“. Today, I saw a great article from The Glitter Guide reminding us about coconut oil’s great uses. It reminded me that I may have put the jar that I used almost daily on the back burner lately. I think it is time to bring it to the forefront of my bathroom vanity to get the most of its natural greatness. Want to read about how coconut oil can bring its other great features to your routine? Then read The Glitter Guide‘s “10 Ways To Add Coconut Oil To Your Beauty Routine“. Great skin care doesn’t have to come from a cosmetic department or the beauty counter at a high end department store. You’d be surprised how many fabulous, natural products can be found right in your local supermarket or organic store. Coconut oil is definitely one of my faves! Read these articles, do some research, and learn how Mother Nature can give you some fabulous skin nurturers and age fighters right from her own earth!